Reflecting on the last time we saw Gordon Freeman. Ten years. It almost doesn’t seem that long since we left Gordon Freeman in the ashes of a dead world, frozen in time with increasingly little chance of the enigmatic G-Man showing up to conclude business. The promise of Half-Life: Episode Three never really died, kept alive by jokes and hopes and increasingly desperate attempts to see a ‘3’ even hinted in anything Valve did. Going back to Episode Two though, it’s not too surprising. The industry’s brief fascination with episodic content was a bad idea for basically everyone not called Telltale, which approached it by carefully working out pipelines for content and limited and games where one team could be working on one episode while another team did the prep-work for the next, allowing games within a couple of months. Valve, like Ritual with SiN: Episodes, was effectively looking at a new game every time, each time having to be bigger and better for a likely diminishing playerbase. Even by 2007, and upgraded over the years with effects like HDR lighting and improved models, the Source engine was starting to creak. Tech aside, the Half-Life 2 world that had looked so real back in 2004 now felt distinctly blocky retrograde in the wake of games like BioShock and Crysis and Call of Duty 4, which, yes, was a very different style, but took shooter set-pieces to crazy levels of polish and inspiration. For Half-Life to continue as a blockbuster, it had to take that generational leap again, and at this point Valve was already turning its attention elsewhere. Soon it was too late. It could risk leaving a gaming generation blueballed over a sequel (and of course the lady equivalent!). It couldn’t so easily risk a Half-Life that didn’t set the world on fire, and it wasn’t long before it was hard to imagine what Episode Three versus a full sequel could realistically do. That’s not to dismiss Episode 2, though. Like the best DLC/add-ons, Valve treated the Episodes not just as more Half-Life 2, but a way of exploring the potential of the game and expand what that actually meant. Episode 1 for instance reversed the order that you got the weapons, cranked up the feel of City 17 being under siege and playing your part in a warzone, and focused on the team-up of Gordon and Alyx Vance, after the largely solitary travels of Half-Life 2 proper. The keyword of Episode Two was ‘freedom’. Kinda. To a point. It certainly wasn’t a game like, say, STALKER, where you could head off in whatever direction you wanted and fight the evil Combine. The path through the game was linear. However, it was also considerably wider, giving you a car and moving out of caves and streets and other very controlled areas to the relatively open roads of the White Forest and its abandoned houses and waypoints. One of its best set-pieces involves defending an empty inn from attack by both regular troops and the game’s new Hunter enemies, and running around from window to window to take on the attackers as they break down the doors and try to swarm you. It’s an open combat environment that feels like a carefully laid trap by the enemies rather than simply holding out against waves, as with a remarkably tedious antlion fight earlier, where you’re running upstairs to shoot out of windows and then back down as guys burst in, and otherwise trying to watch your flanks like an actual guerrilla warfare situation. The thing is that replaying the game, despite having fond memories of wandering around the countryside and so on, the road trip is only about an hour of its running time. The first part is all underground, in a tedious trek through a maze of antlion tunnels, and just as you’re starting to enjoy the driving around, it’s over, give or take some conversations with NPCs that definitely didn’t drag on this much in 2004-2007 and can’t be sped up no matter how much junk you throw in their faces with the gravity gun (still, incidentally, one of the greatest weapons ever invented). Only then do you get another taste of freedom with the final boss—another non-linear base defence bit, this time involving a car, attacking Striders, and the expansions’ one new weapon—a bomb created by new character (but old Black Mesa scientist) Magnusson. It’s a fun, tense standoff that certainly beats the heck out of fighting Nihilanth in the first game, or the dark matter Skeeball that ended Half-Life 2, but it’s also over pretty quickly. Like so much of the episode, the openness feels transitionary—the acceptance that Half-Life needed to grow into something new and the realisation that the tricks that were so cool in 2004 were wearing thin. Even then it gets some fun use out of physics, like smashing open a door with a carefully positioned cart, but still. It remains a fun enough shooter, but the reality versus the memory is definitely unsatisfying. It doesn’t help that it’s the middle part of a trilogy, and in Empire Strikes Back fashion, one that exists primarily to set up the finale. Emotionally, it ends on a low, with a big win for our heroes, but the brutal murder of a major character right in front of both Gordon and Alyx. The job isn’t just unfinished, it’s unfinished leaving at least one big maggot-shaped alien needing a kicking. Luckily, we now have at least some idea of how things would have gone, courtesy of writer Marc Laidlaw’s "Epistle 3". This not-exactly-coded ‘fanfic’ took the form of a letter from one 'Gertie Fremont' to find a ship called the 'Hyperborea' in the Antarctic and defeat the evil 'Disparate', and tells of a last-ditch suicide mission to the heart of the alien menace, before loyal partner 'Alex Vaunt' gets whisked away by a mysterious suited presence and 'Gertie' is likewise pulled from the action by the not-Vortigaunts. In short, a more explosive cliffhanger, not a big series finale. It’s important to note that even outside the tongue-in-cheek premise, Laidlaw wasn’t the only writer of the Episodes, no longer works for Valve, there were no doubt many revisions of the story (Laidlaw himself has said that ‘Like most things in the HL series, answers are developed strictly as needed’ —there is no official big secret to be revealed about, say, the identity of the G-Man) and it’s anyone’s guess how Episode Three would actually have played out. Still, it’s both more than we usually get when series fizzle out, and better than leaving Gordon staring at a corpse for all eternity. Now, if some of this sounds harsh towards Episode Two, it’s largely in retrospect. At the time, even with its issues, it was an exciting step forward for the series and a fresh take on things. Half-Life 2 in all its forms is still stunningly playable for its age compared to most of its peers, helped by its commitment to staying within Gordon’s POV and its set-pieces typically flowing naturally and designed around the game rather than being a flashy background to climb over or simply witness. 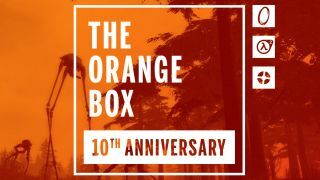 Episode Two was a great couple of hours of action, even if it was somewhat upstaged by the other parts of The Orange Box—Portal’s sheer novelty, and the beyond-wonderful early TF2. There’s a reason that everyone wanted Episode Three so much, and it wasn’t just to see what happened next. While Episode Two wasn’t Valve’s best moment, it was Valve at its most exciting time creatively. The company that would do something like The Orange Box. The company that had overcome everyone’s early dislike of Steam to create a platform people actually wanted to use. The company that could do absolutely anything, make whatever game it wanted, and be guaranteed to deliver. The promise of Episode Three, much like Half-Life 2 before it, was that it could be anything but was sure to be great. And maybe the result could have lived up to that. Maybe. Or maybe not. We’ll never know for sure. But at least we can savour what we actually got. We’ll always have City 17.